Microsoft is planning to ship its Surface Hub 2S conferencing room product in the second quarter of 2019, according to a Monday announcement. Microsoft had previewed the Surface Hub 2S product back in May, although it was just described back then as the "Surface Hub 2" product, with no "S." There also will be another product, called "Surface Hub 2X," which will be the next-generation product, which is expected to be available sometime in 2020. The "S" in Surface Hub 2S name could signify that it runs Windows 10S, which is a more locked-down form of the Windows 10 operating system. However, Microsoft's announcement didn't explain the "S" addition to the product's name. Surface Hub 2S devices will be upgradeable to Surface Hub 2X devices via a processor cartridge that can be removed from the device and upgraded, Microsoft's announcement explained. The announcement didn't elaborate on the differences that will arrive with Surface Hub 2X devices, except to say that Surface Hub 2X devices have rotation and tile capabilities, as well as the ability to enable multiple user logins. 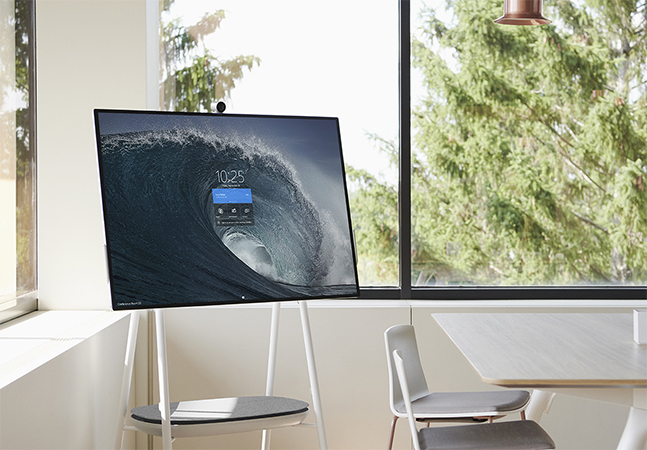 Microsoft previously described the Surface Hub 2 as having a 50.5-inch 4K multitouch display with white-boarding capabilities and "intelligent inking," which can be mounted on a wall or put on wheeled stand that was designed by Steelcase. The Surface Hub 2S is lighter than its predecessor, although the screen size is smaller than the screen sizes of the first-generation Surface Hub, which had 55-inch and 84-inch options. Surface Hubs can only run Universal Windows Platform applications and Microsoft Office applications. The devices include Bing search capability and have support for Skype for Business unified communications or the Microsoft Teams collaboration app. Current Surface Hub devices run an application called "Microsoft Whiteboard 2016" with drawing capabilities, including the use of so-called "intelligent ink," which converts hand-drawn shapes into more polished ones. However, the Microsoft Whiteboard 2016 app is going to get supplanted. Late last year, Microsoft announced a preview of a Microsoft Whiteboard app for Windows 10 or Windows 10S systems, which became generally available back in July. This Windows 10 version is being groomed as the eventual successor to Microsoft Whiteboard 2016. However, it's possible to run the two apps concurrently without conflict, according to this Microsoft support article. The Whiteboard app is also available for use on client devices. It enables remote collaborations on drawings. On Tuesday, Microsoft announced the availability of the Whiteboard app for iOS (downloadable for Apple iOS 9 or later devices), as well as a preview of Whiteboard app on the Web, which is the browser-based version. The app permits drawing, the stacking of images and the addition of sticky notes, and the work will get automatically saved to Microsoft's cloud storage. A Microsoft support article noted that the Whiteboard Web App will get rolled out to Office 365 subscribers gradually. However, it won't be enabled by default. An Office 365 "global administrator" has to enable it using the Office 365 Admin Center, if it's wanted.